Wrapper module to allow users to develop new modules written in Python. This wrapper module calls a process function written in Python on every frame. Note how sendSerial() is added dynamically after the python class is defined, as a new member function of the class. Definition at line 189 of file PythonModule.H. Constructor needs the full path to a Python source code file. Note that, contrary to C++ modules, construction will not throw. 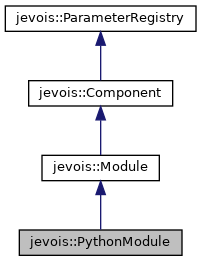 This is so that the module is always valid and initialized, and its module path can be set by Engine, which is necessary to allow saving the source code from JeVois Inventor. Instead, any construction error is stored internally in this class and will be re-thrown at any access to process(), parfseSerial(), etc. Definition at line 232 of file PythonModule.C. References jevois::getPythonExceptionString(), jevois::VideoMapping::ispython, LFATAL, jevois::VideoMapping::modulename, and jevois::VideoMapping::sopath(). Definition at line 278 of file PythonModule.C. Definition at line 301 of file PythonModule.C. Optionally call uninit() python module function, if implemented. Definition at line 271 of file PythonModule.C. Processing function, version that receives a frame from camera and sends a frame out over USB. Definition at line 282 of file PythonModule.C. Processing function, version that receives a frame from camera and does not use USB. Definition at line 292 of file PythonModule.C. Definition at line 313 of file PythonModule.C. Initialize Python, numpy, and allow python modules to send serial outputs through the JeVois Engine. This command is not for common use, only Engine should use it.